The rich atmosphere of South Carolina, Hilton Head and Charleston, is brought vividly to life by Dorothea Benton Frank, a South Carolina native who, with her exquisitely evocative prose, makes you smell the sea air, see the palmettos, and savor the sweet tea, but this time it comes with a side of antipasti. Hilton Head, a South Carolina retirement heaven -- at least it's supposed to be, but for Big Al and Connie Russo, the move from New Jersey to this southern paradise has been fraught with just a few complications. Especially for their daughter, Grace. 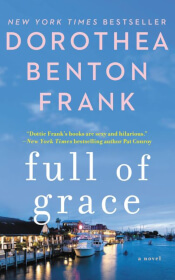 Read a Preview of Full Of Grace here!